24-year-old Singer/Songwriter Alec Benjamin is on the verge of something big and if the success of his gorgeously-moody single Let Me Down Slowly is any indication of what’s to come, be ready for a lotta Alec. The Track which also has a version featuring Toronto’s Alessia Cara while released last spring, suddenly has caught fire, just entering the Top Forty in the U.K., achieving Platinum certification in Canada and Gold in the U.S.
He’s prepping the release of his debut album for Warner Music Canada coming this fall, Narrated for You and currently is bringing his Outrunning Karma Tour to theatres in sold-out numbers. Toronto was no exception. Not bad, considering he had a false start after being released from his contract with Columbia Records not too long ago. His career quickly has regained momentum and we had the opportunity to chat with Benjamin even though he was fighting a cold, prior to his show at The Mod Club. The Phoenix native lost access to his data and was trying to get his iPhone X to connect without luck until venue Wi-Fi came to the rescue. I ask him what Instagram and Twitter are like for someone with hundreds of thousands of followers and it’s actually pretty much the same as it is for the rest of us. You see every single “like” and comment on the former, while the latter filters and groups things a bit more. I know now, I actually got to play on his accounts. We ask him about Elon Musk, someone he really looks up to and epically getting a Tweet back from the technology entrepreneur after suggesting to him on Twitter, the idea of eco-friendly tour buses. Benjamin: “It was pretty cool, because I’m a huge fan of his. There’s pretty much nobody in the world doing things that he is doing. And so I feel like he’ll be one of the most influencial inventors of our time, so to know that he knows that I’m alive, that’s pretty cool.” . Himself fighting to stay healthy, we ask Benjamin about surviving the rigours of tour life. Benjamin: “One of the struggles of tour life logistically, not just on your body, is how I understand what the tour bus is doing to the environment and I’m not the most caused-based person, but I do care about a lot of things. It’s difficult to reconcile the environment with the necessity of day-to-day life so I have to go out and tour and go out and burn gas and fly. Sometimes I feel like a hypocrite.” . “I thought if I could get a tour bus that was eco-friendly, that’d be great so I’m gonna Tweet Elon Musk right now.”. We ask Benjamin about his dream collaborations after having worked with Toronto’s Alessia Cara. Benjamin: “Definitely Elon Musk” , he says semi-kiddingly. “I just wanna make better Music on my own first.”. Benjamin‘s Music embodies a mood all its own. We wonder what we can expect from his forthcoming debut Disc. Benjamin: “I think this batch of songs is gonna be slightly more mature than the last. A lot of those songs I’ve been saving for a while because I had a whole batch of Music I made when I was signed to Columbia Records and subsequently I was dropped from the label. I didn’t want to lose those songs, so as I was signing a new record deal, I got those songs back. I wanted a few of those songs to have a life on Narrated for You.” . 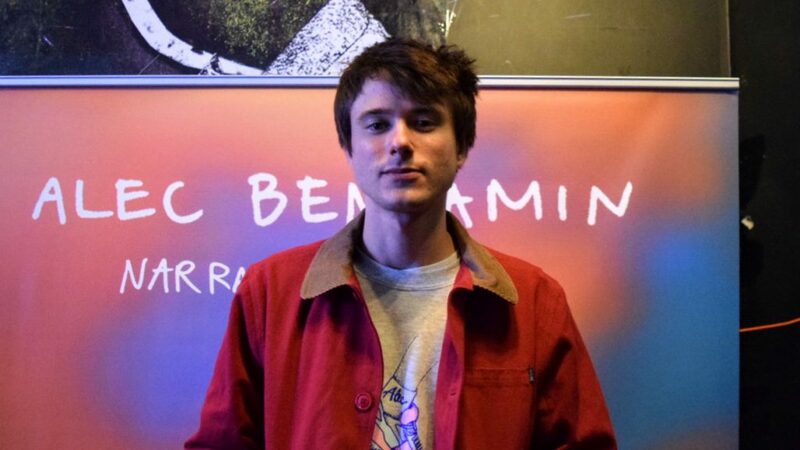 What’s next for Alec Benjamin? Benjamin: “I’m just gonna keep touring and writing songs. It’s a constant struggle in my life to keep making music and try to stay happy. Maybe I’m just chasing something that doesn’t even exist. I’ll play this venue and then I get to the next one and I go maybe this one, that’s the one!”.